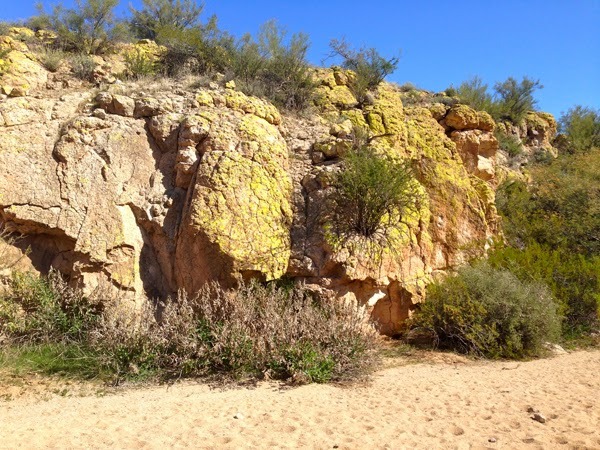 For those of you that have just started following the blog. 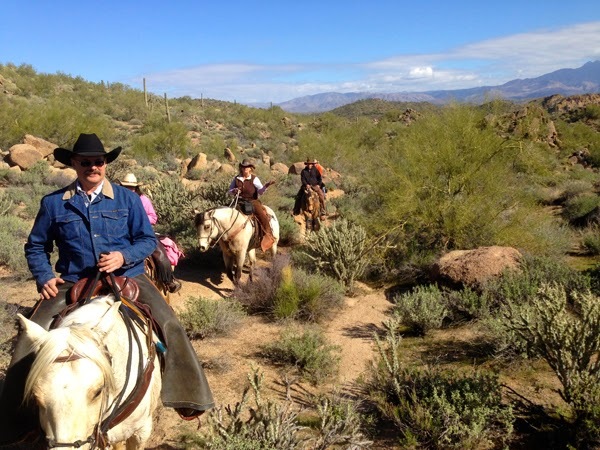 We traveled down from Merritt, British Columbia, Canada Jan 2/2014. 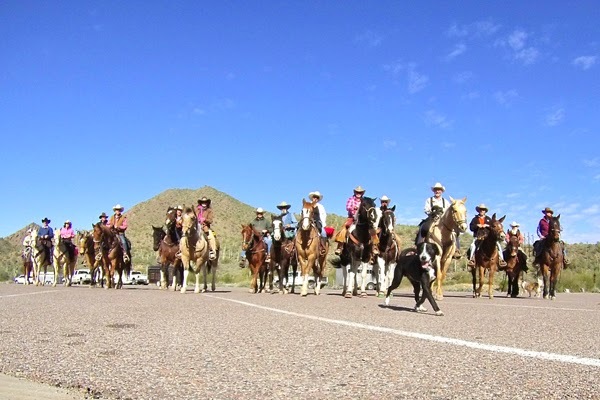 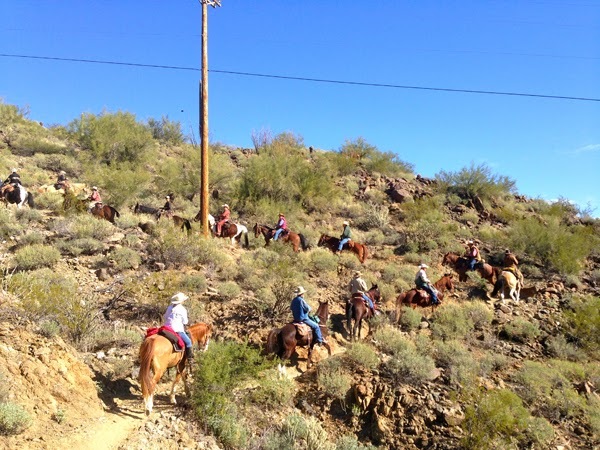 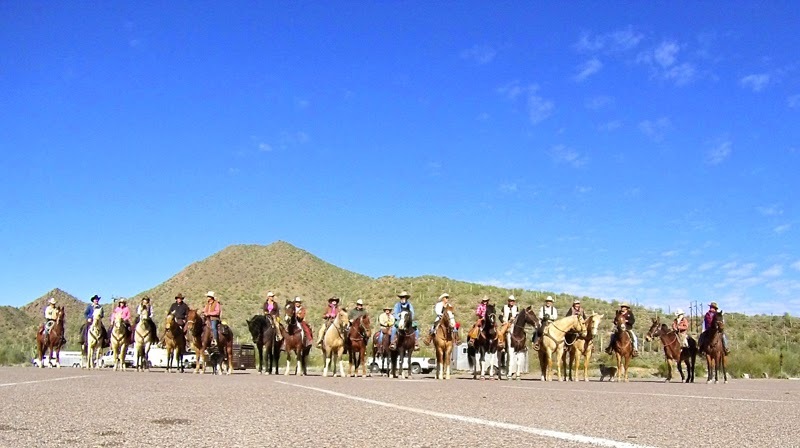 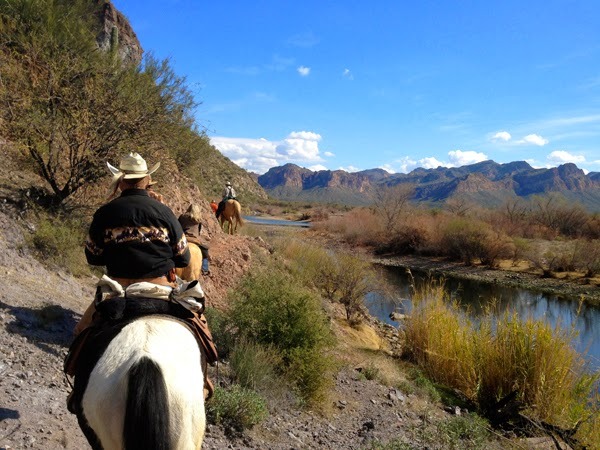 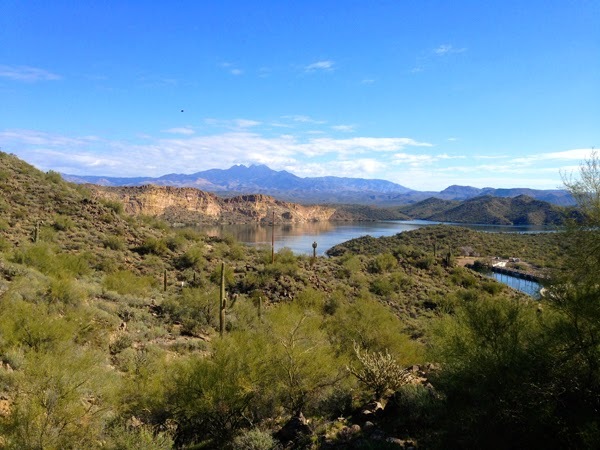 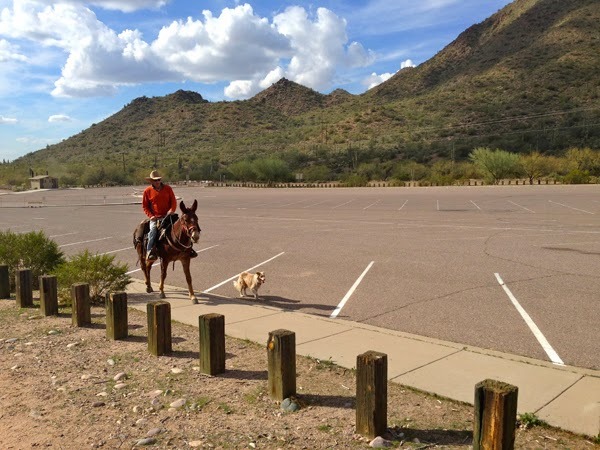 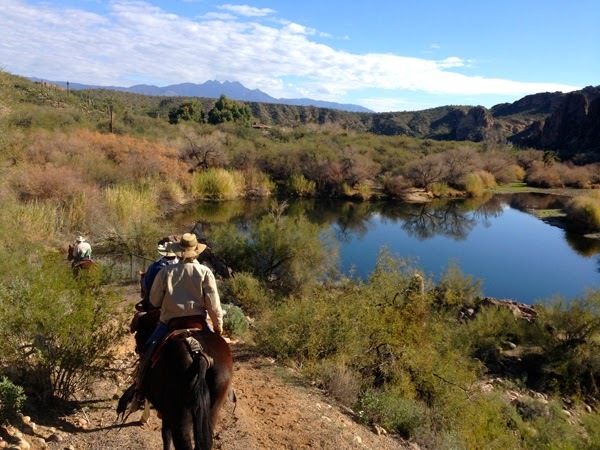 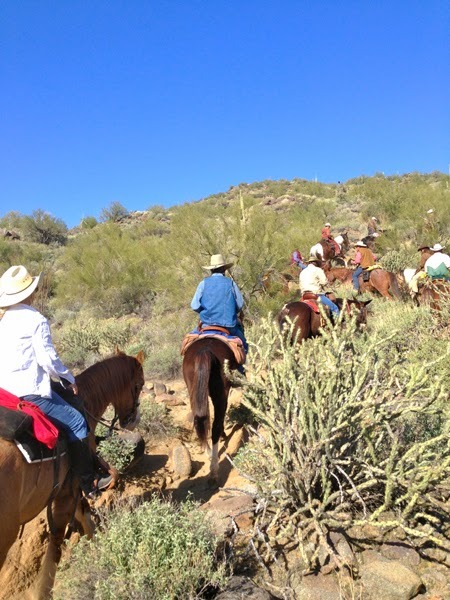 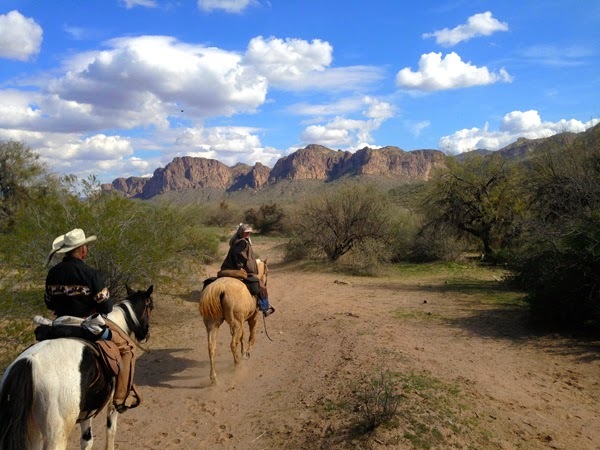 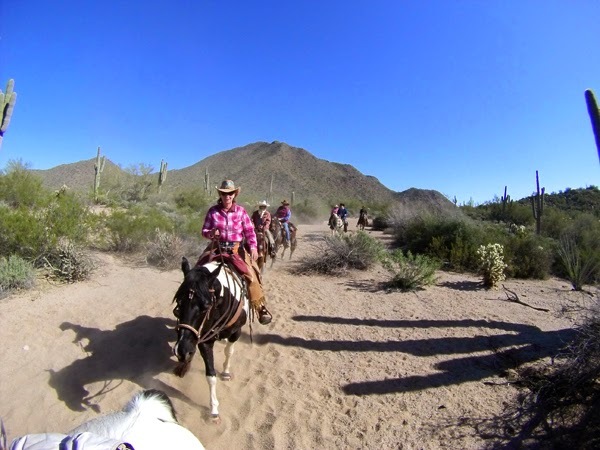 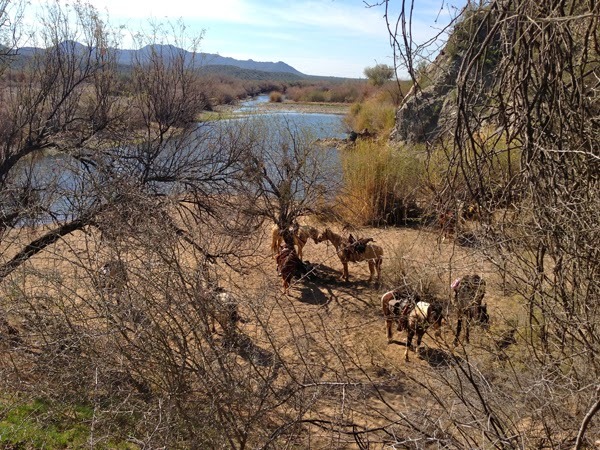 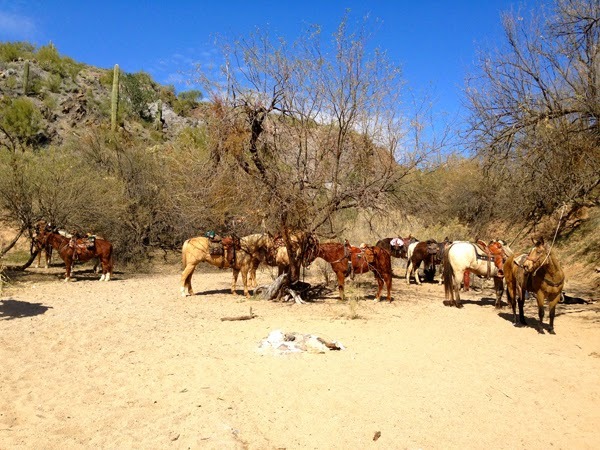 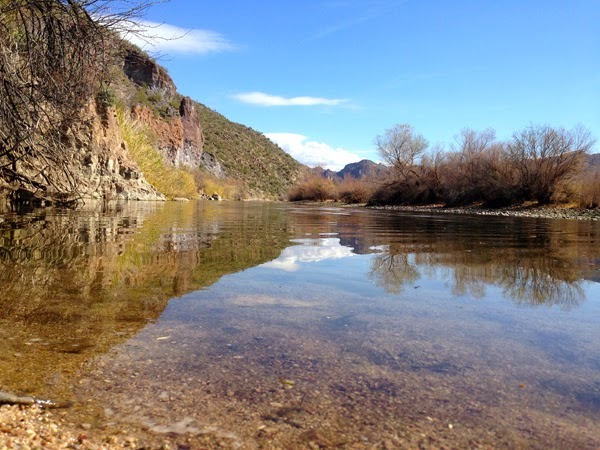 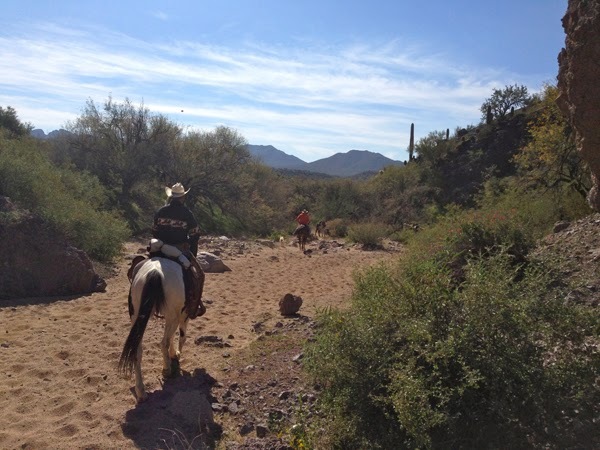 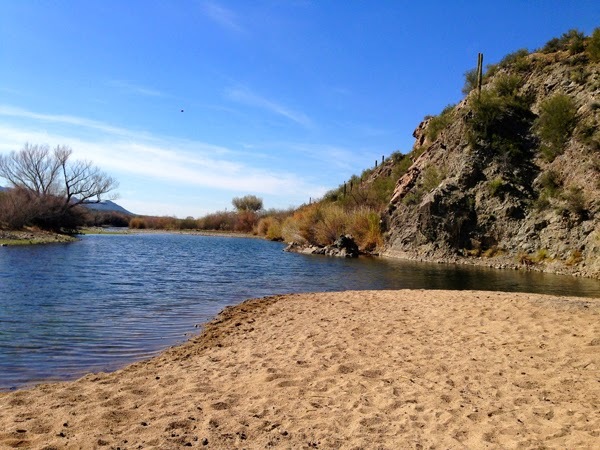 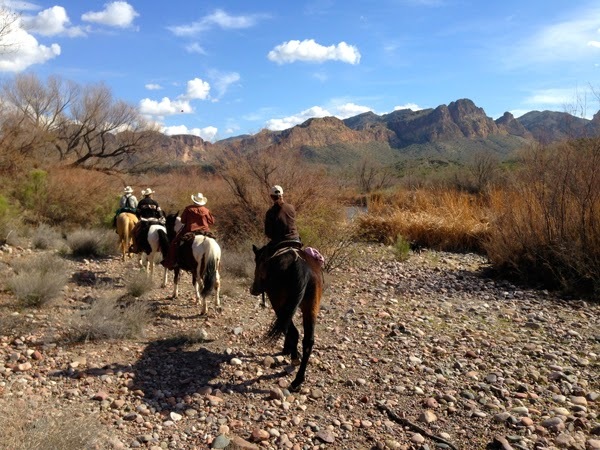 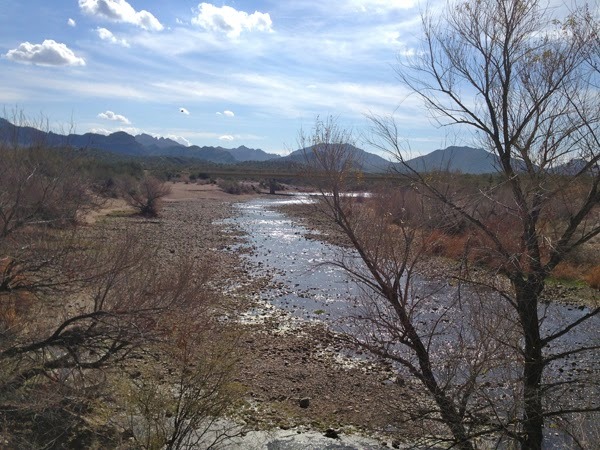 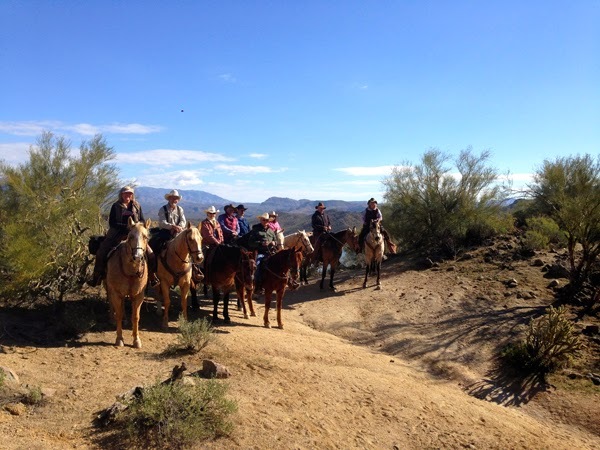 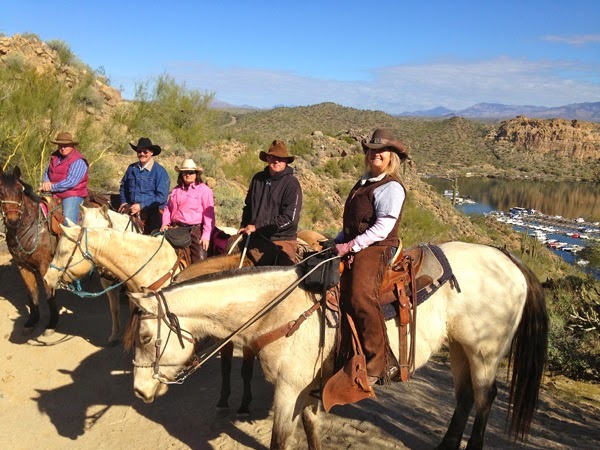 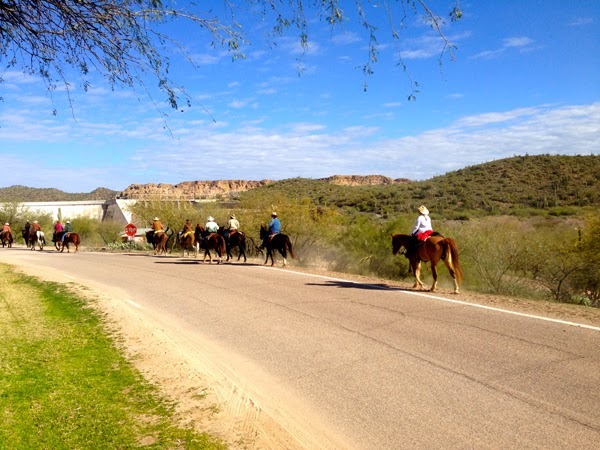 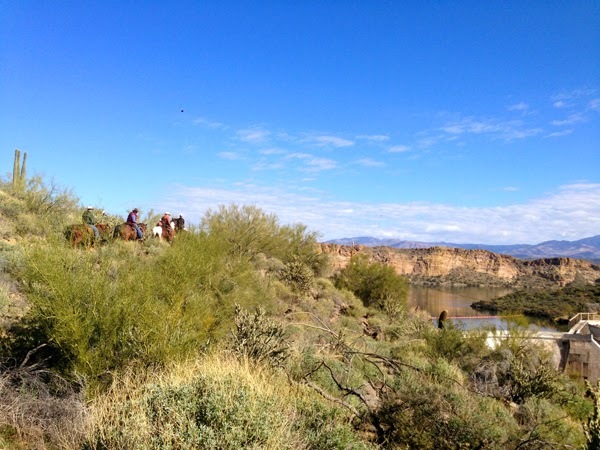 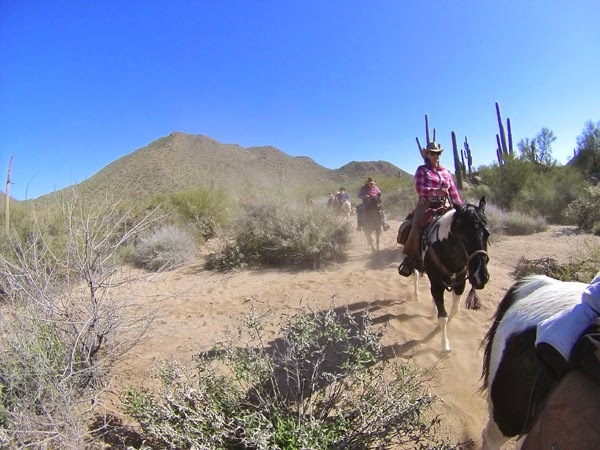 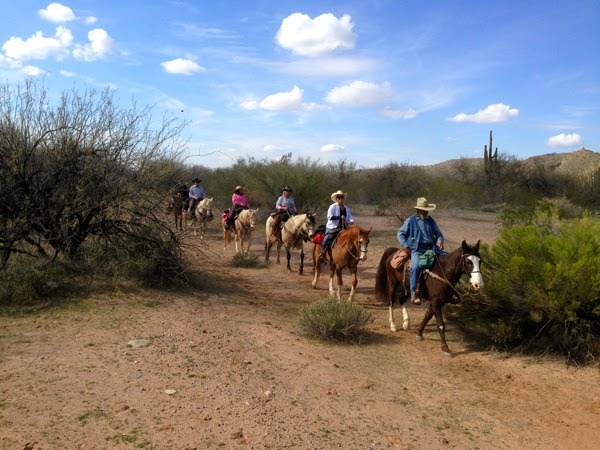 I have been blogging about all the wonderful trails we have been riding and places we have camped to help pave the road for anyone else coming to Arizona to ride. 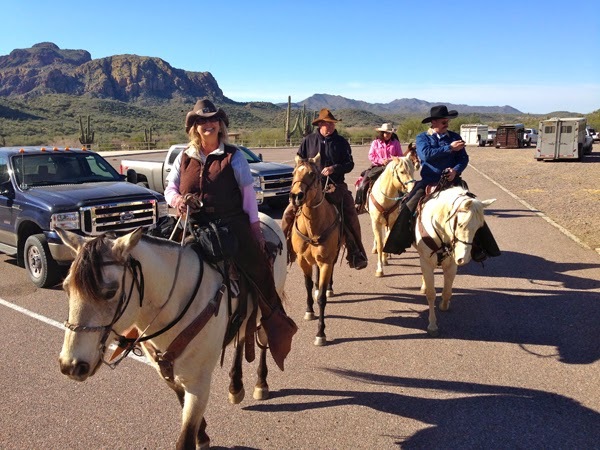 We are camping at Goldfield Ghost Town just before Lost Dutchman State Park just off Hwy 88 (Apache Trail) Apache Junction Arizona. 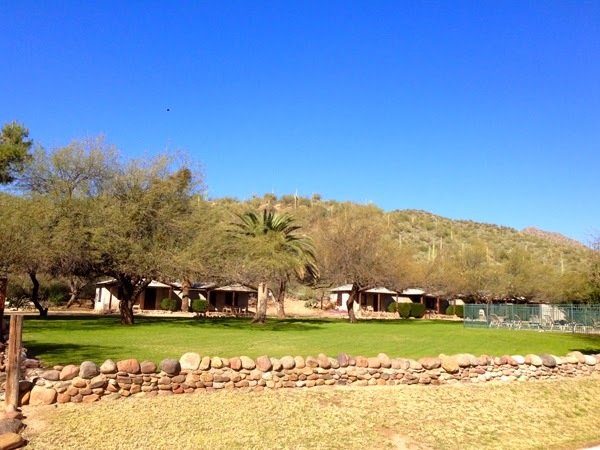 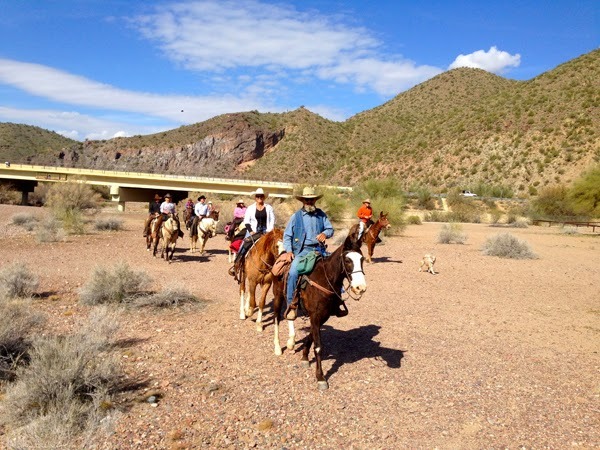 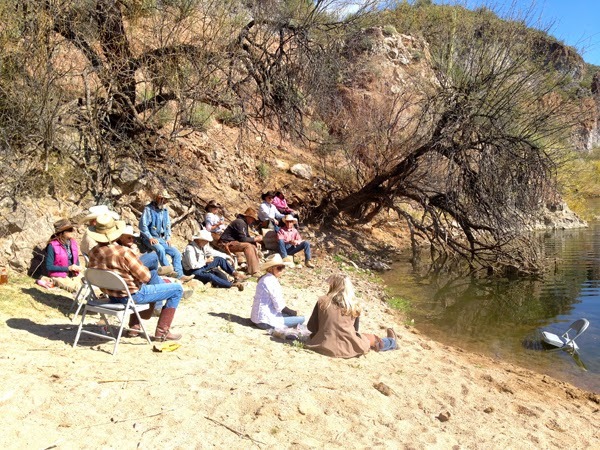 Camping at Goldfield is $15 per night for dry camping horses are extra at $7 each. 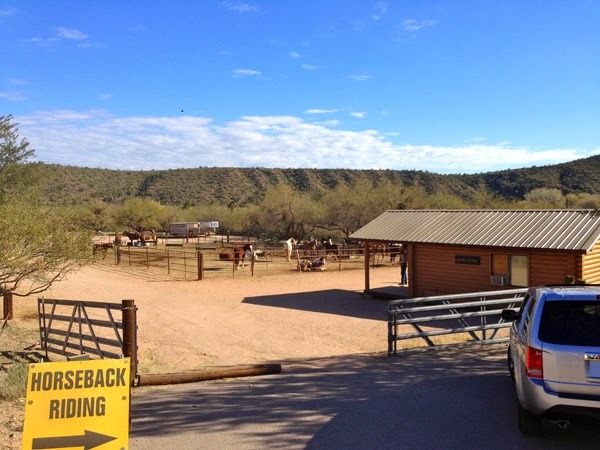 They have corrals right in the parking area before the campsites. 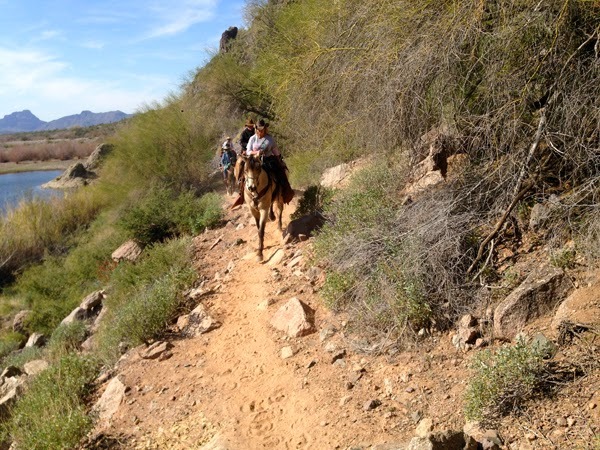 You can ride a different trail everyday in this area. 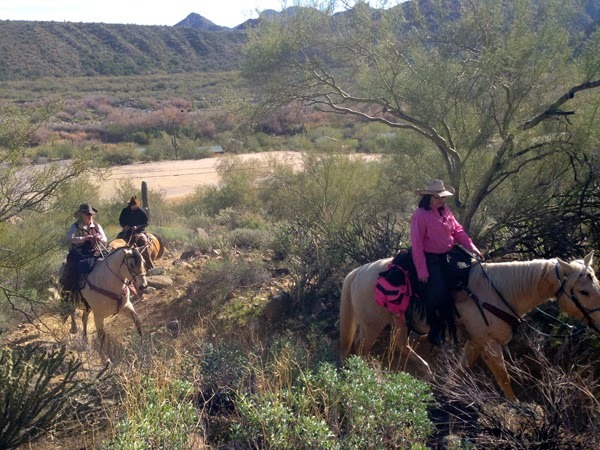 We have been coming to Arizona since 2007 so have ridden many of the trails out the back of Goldfield so this year we have been trailering out thanks to a friend of our Alan Gillman. 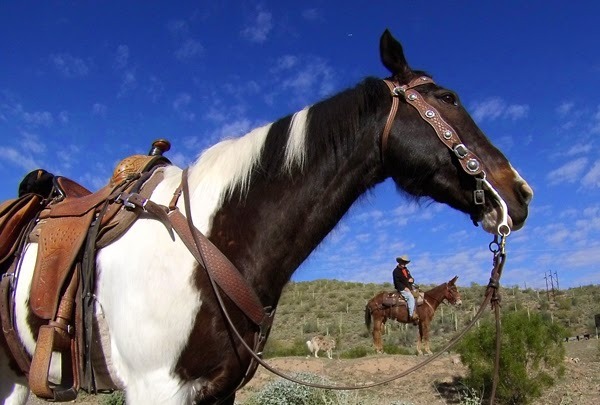 He has a gooseneck that can fit up to 6 but best with 5. 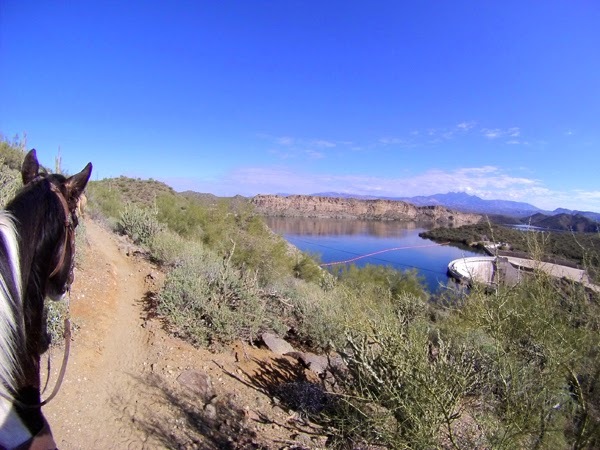 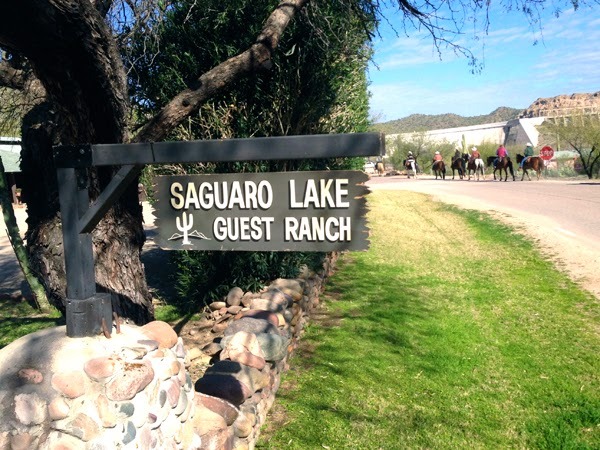 Today's ride took as back for the 3rd time to the Saguaro lake area. 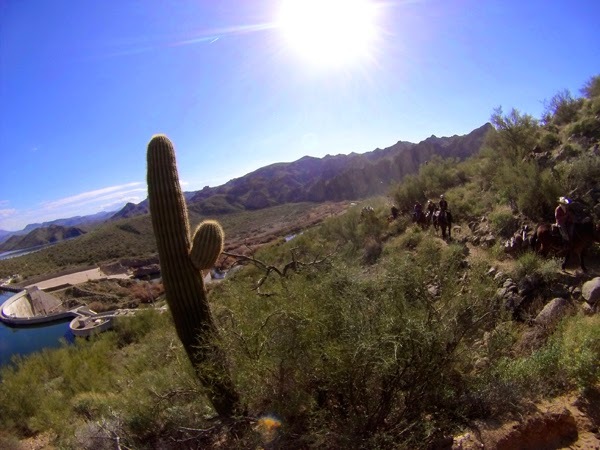 Just beautiful here. 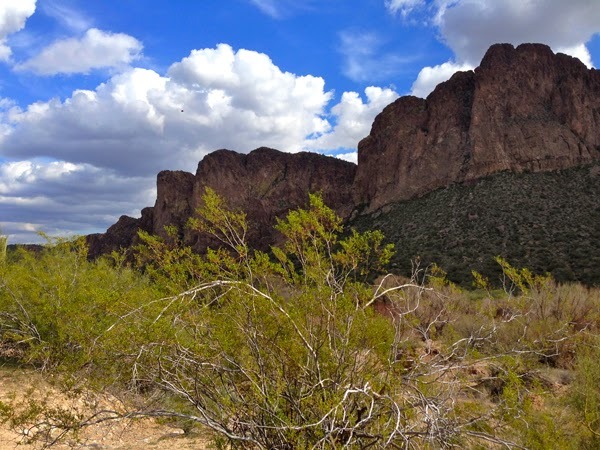 Again to get there say from Goldfield Ghost Town head right on Hwy 88 (Apache Trail) until you hit E Lost Dutchman Blvd turn right this road turns into Brown Road, follow it until you get to N Ellsworth just before Hwy 202 again take a right follow the road down it will turn into N User Pass Rd you will come to a stop sign at the Bush Hwy again turn right take this all the way to the E User water parking lot. 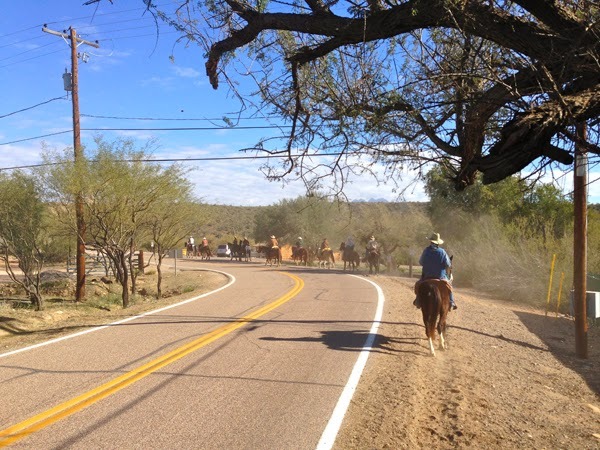 It is also on the right side just before the road binds North. 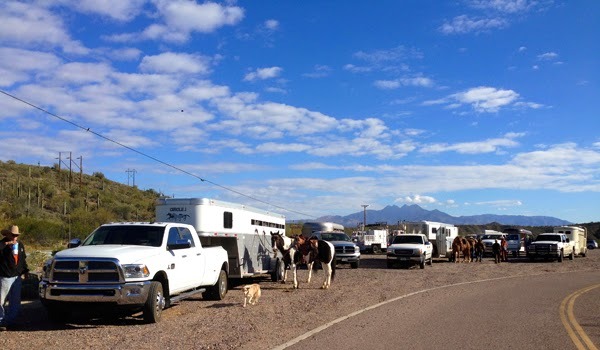 Once in the parking lot go to the left for trailer parking. 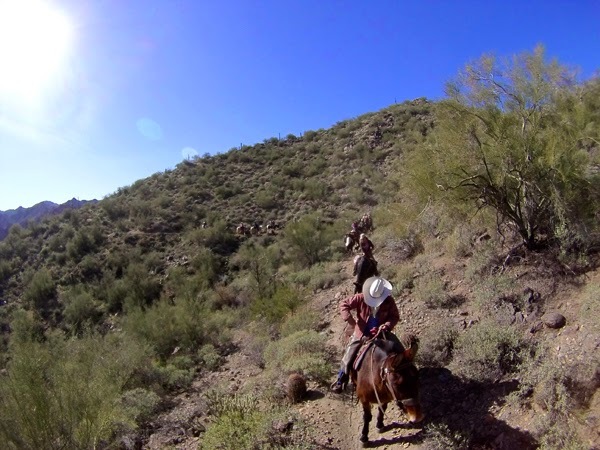 There are trails all over the place from here. 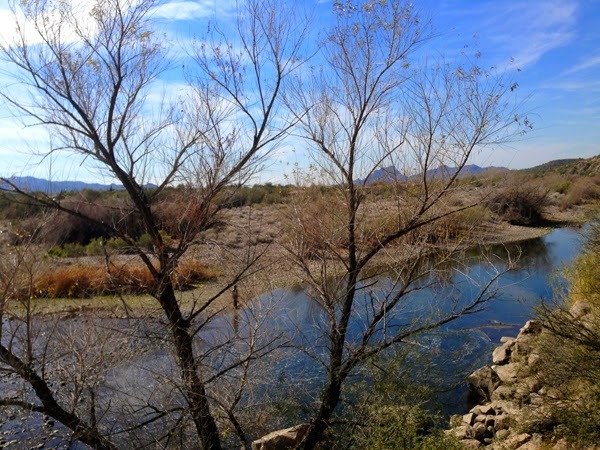 Just before the Dam you will see a trail going to the left up the hillside. 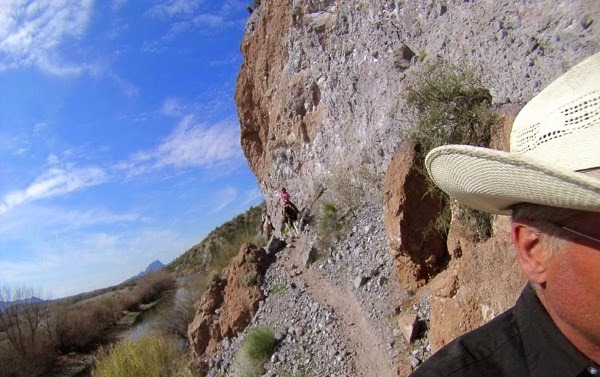 Take this trail all the way up over the lake views. 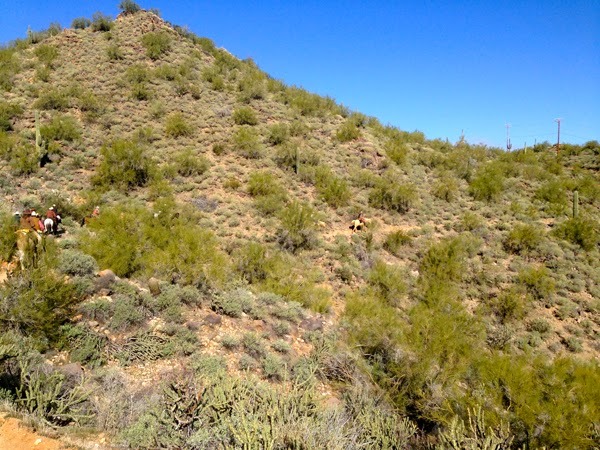 Just before you get to the Bush Hwy you will see a trail to the left follow that and then cross the hwy. 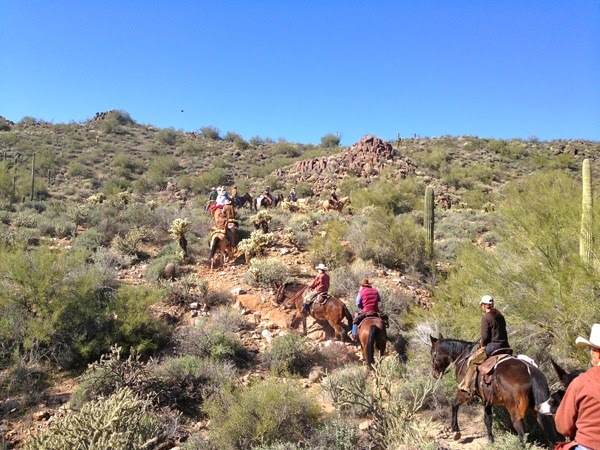 Once we crossed the hwy we took the sand draw to a trail followed the trail until it forked we took the right fork. 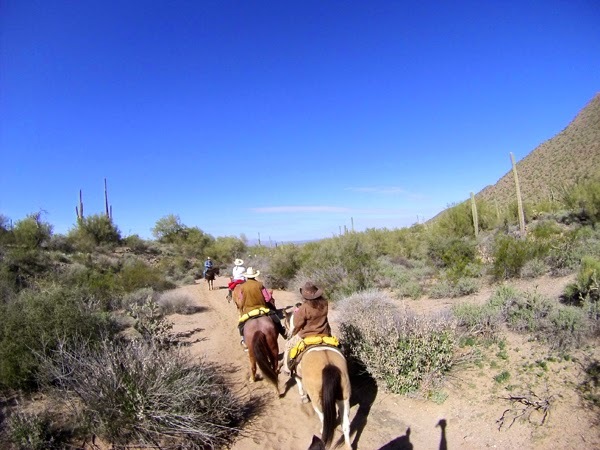 (If you take the left fork and stay left you will go down a sand draw and through the tunnels under hwy. 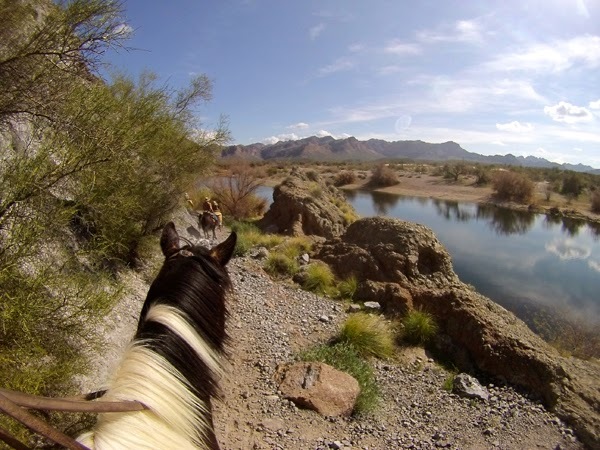 once through the tunnels go right and you are back at the parking lot.) 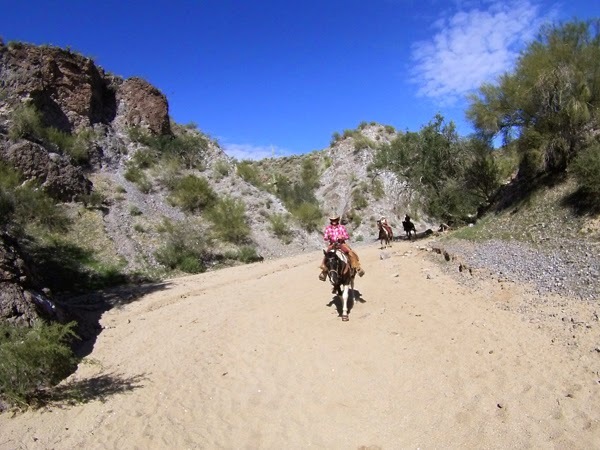 We took the right fork this took us on a longer ride up the trail (above picture and picture below) then we came into another sand draw that we followed all the way back to the Salt river. 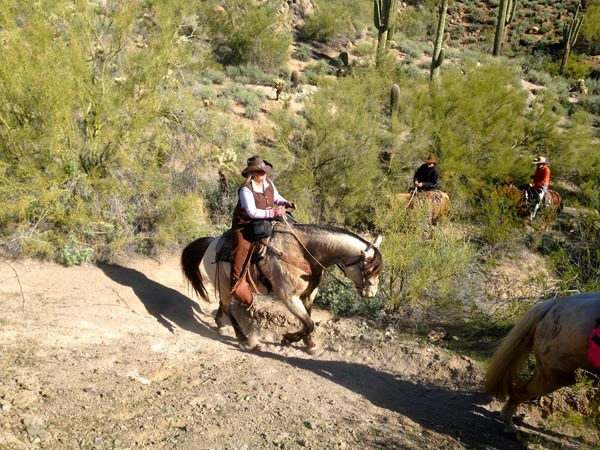 It is a little bit ledgy( picture of me here).